Studies in Music, the University of New Mexico and Eastern University. Studied with Warren Gref, Ralph Pyle, Wayne Sharp, and Joel Scott. Master Classes with James Decker and Dale Clevenger. Performed with the Santa Monica Symphony, Ventura Symphony, Westminster Symphony, Pasadena Chamber Orchestra, Santa Barbara Symphony, New Mexico Symphony, Santa Fe Symphony, Sinfonia de Albuquerque, San Juan Symphony, Roswell Symphony, Santa Fe Opera, and ACLOA. 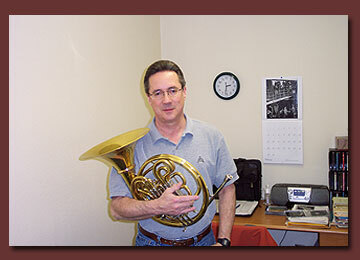 Founding member of the Albuquerque Wind Quintet. Private instructor since 1984, at Baum's Music, with many students who have participated in All-State and Youth Symphonies.